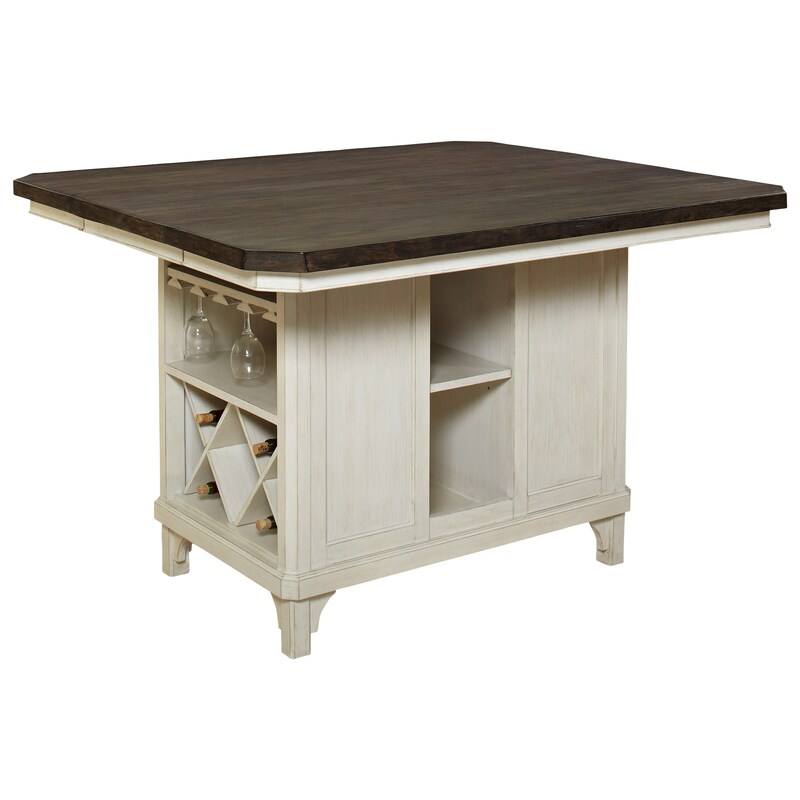 A wonderful centerpiece for your dining setting, this accommodating kitchen island adds extended storage to your home. Featuring four elegant feet, the piece includes two drawers and three shelves in addition to bottle storage, stemware racks and open shelf storage. Versatile and well-crafted, One 18" leaf is included and expands the table surface from 30" to 48" for larger occasions. The Mystic Cay Kitchen Island with 18" Leaf and Bottle Storage by Avalon Furniture at Zak's Home in the Tri-Cities, Johnson City, Tennessee area. Product availability may vary. Contact us for the most current availability on this product. Case Construction Constructed from rubberwood solids with ash, birch, and pine veneers. The Mystic Cay collection adds elegant and unique design to your home. Versatile and accommodating, the pieces feature extensive storage features. This beautiful collection of furnishings will transform your home into the farmhouse style dwelling of your dreams. The Mystic Cay collection is a great option if you are looking for Relaxed Vintage Transitional furniture in the Tri-Cities, Johnson City, Tennessee area. Browse other items in the Mystic Cay collection from Zak's Home in the Tri-Cities, Johnson City, Tennessee area.